Sugar: Oh So Sweet, Or Oh So Evil? When you consume sugar, the bacteria in your mouth produce a sticky film called plaque on the surface of your teeth. The plaque feeds on the sugar, turning it into an acid. This acid then eats away at the hard enamel on your teeth, and over time, a cavity forms. Be sure to visit your Dental365 dentist twice a year to ensure that you and your loved ones' teeth are healthy and cavity-free. We know that sugar is bad for your teeth, but sometimes we all give in to the sweet temptations that seem to be surrounding us. 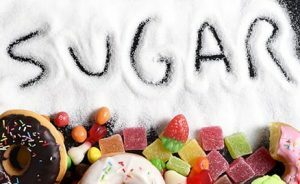 Try to limit your sugar intake to a rare treat and only eat sugary foods on special occasions, such as your birthday or holidays. And be sure to brush immediately after. Also, remember to check the sugar content in items you wouldn’t expect to have high doses of sugar such as bread, crackers, yogurt, and tomato sauce. When reading ingredient labels keep in mind that sugar may not be listed as “sugar”. Food manufacturers often use “sugar aliases” to hide added sugars. Use the long list below to make sure you’re not being tricked into buying items with added sugar.